On a hot June afternoon, a dozen expats met at Hannam Station Exit No. 1 and took a short walk over to Yongsan Senior Welfare Center to strike up conversations with the middle-aged men and women there. They are a diverse bunch. Some are on working holidays, drawn to Korea by a fascination with K-pop. Others are between jobs, keen to verify the depiction of the Korean War in their textbooks with the generation who experienced that period in history. Inside the teaching room, they stood in single file and wrote their names on a board. Kim Soon-shim, who has been teaching for 42 years, told the advanced English class in front of him to focus. It was time for volunteers to converse freely with students, he announced, and for the students to put the English he had been teaching them to practical use. Looking around the room, watching groups talk about topics as varied as their ambitions, solutions to boredom, competitive streaks and education over an hour, it was hard to disagree. German volunteer Steffi Kuehnel asks senior citizens about their lives. (Aparna Balakumar). These seniors clearly have a lot to say. They are just searching for a nonjudgmental space to test the waters. For Lee Jim-kee, the class allows him a rare chance to socialize and keep his mind alert. The 86-year-old has been battling cancer for nearly a decade, but refuses to let fatigue from his treatment keep him housebound. During his working days, he had to negotiate business contracts in fluent English, traveling as far as England, America and Europe. Doing activities at the center, including translating a Time Magazine page once per week with his peers, helps him reminisce about fonder memories abroad. Another senior student, Kim Hag-soo, says the program has improved his language abilities and willingness to share his wisdom with a younger generation. When he enrolled in the classes 11 years ago he struggled to hold a conversation in English, but this is no longer the case. 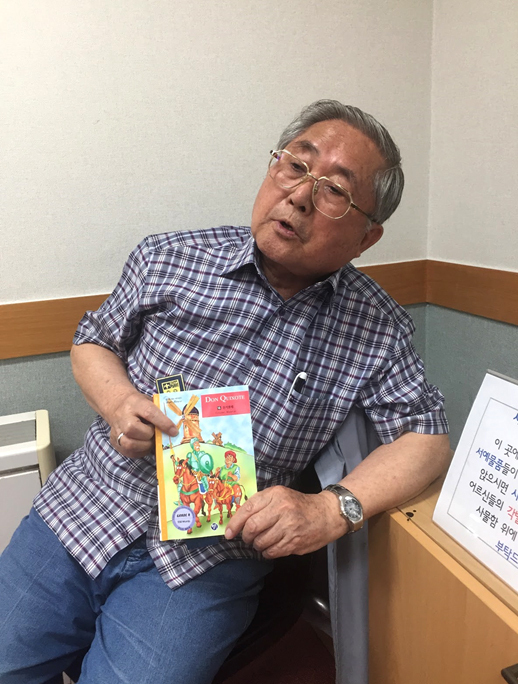 “I think it is a very good opportunity for seniors to talk with foreigners and feel the belief that they can speak English,” the 75-year-old says. The program is indeed organized with the mental wellbeing of the senior population as a focus. 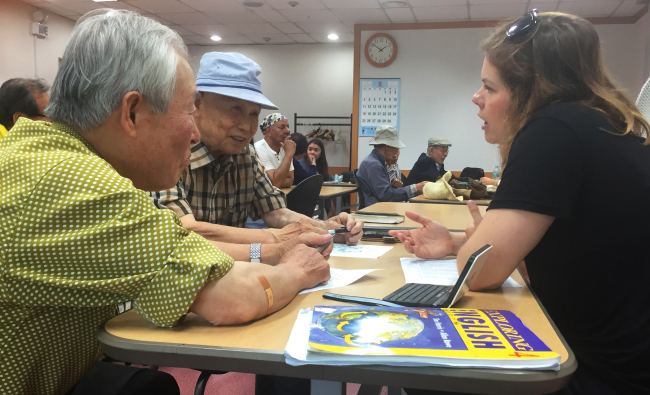 Katherine Cortiza, who coordinates the volunteers on behalf of the Itaewon Global Village Center, says the idea behind teaching the seniors English is to keep their minds sharp. Not all topics are fair game though. “Koreans can be a bit frank,” Cortiza explains, which can come across as confrontational to some first-time volunteers. For these reasons, she suggests steering away from discussing politics, religion or race, unless attendees are prepared for some opinionated responses. And yet it’s this unique perspective from a different generation that appears to attract the majority of the younger volunteers. Irina Holt, a 31-year-old expat, has only been married for two years. She enjoys asking the seniors for advice on how they have kept the passion alive in their relationships for over 50 years. At the other end of the spectrum is the youngest volunteer, 16-year-old Romy Kim. She is on summer break and is thankful for the opportunity to facilitate conversations across generations. “I personally want to hear their perspective on the world and their lifestyle,” she says. “I really want to see their thoughts on the world.” Her favorite questions to ask include advice on fulfilling her ambitions and getting tougher as she begins to take on the world. Nestled away in the corner though is Kim Soon-shim, or “Sonney” as he is fondly known. He seems to derive the most satisfaction from watching his students engage with their new friends.